As one of America’s premier academic medical centers, Michigan Medicine has earned an excellent reputation for the quality of care we provide to patients and their families. 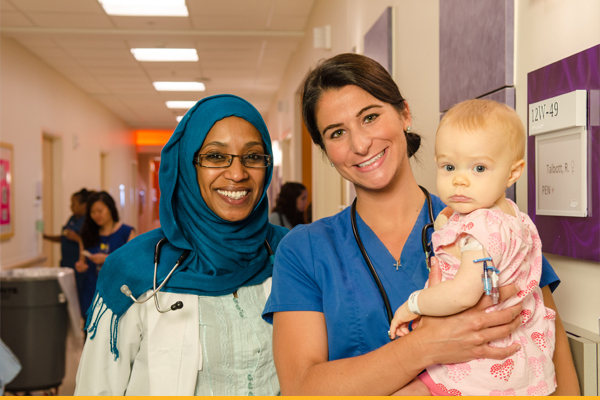 So, it should come as no surprise that we place equal emphasis on caring for the thousands of members of our employee family whose talents and dedication embody The Michigan Difference . Our employees work hard for us, and for those we serve. And, as part of our total commitment to them, we are proud to offer an extraordinary selection of benefits*, resources and programs that help them make the most of their careers, and their lives. * This information is intended as a general overview of the benefits Michigan Medicine provides to our employees. While many benefits apply consistently and universally across our system, there are variables in how certain benefits and programs apply within specific job areas. For complete details on benefits within your area of interest, please inquire with your recruiter or hiring manager. Choose the plan options and coverage amounts that best suit your individual or family needs. Providing valuable time away from work, to meet personal needs, enjoy family time and recharge your passion for the challenging work you perform with us. Michigan Medicine employees accrue paid time off each month, at rates based on their specific appointments and FLSA status. During the first year of employment, staff members acquire more than two weeks of combined sick, vacation and personal time, in addition to paid observed holidays. Over time, employees can accrue in excess of six total weeks of paid time off per year. Michigan Medicine also offers employees the flexibility to substitute observed holidays for additional time off to meet personal needs, as scheduling allows. Rewarding employees who desire to further develop their professional careers through additional education. After six months of employment, employees become eligible for our tuition support program, which provides partial reimbursement for job-related education courses or degrees that lead to other careers within the University. Offering resources for employees to create and enjoy a prosperous future, beyond their working years. 2:1 Matching – contribute 4.5% of your salary to the retirement annuity plan, and UMHS contributes an additional 9% in matching funds after the first year of employment. 100% Employee Vesting – All retirement savings plan contributions and earnings are vested immediately. This means that your contribution AND the University’s contribution and earnings are yours for retirement, or to be paid to your designated beneficiary or beneficiaries in the event of death. Promoting healthy lifestyles and choices for our employees – physically, mentally and in the workplace.